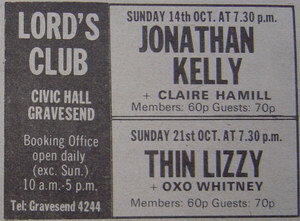 730210 Leas Cliff Hall Folkestone, UK Chris O´Donnell in audience. 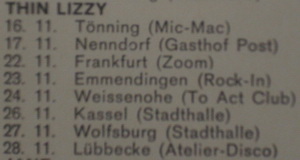 The monday after Chris start working as Lizzy´s agent and he booked 28 shows for August. 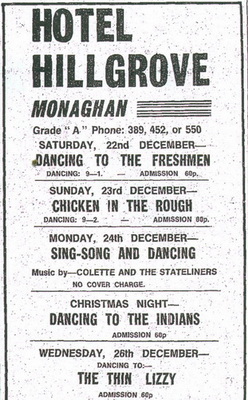 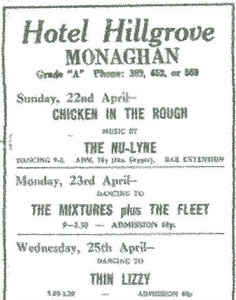 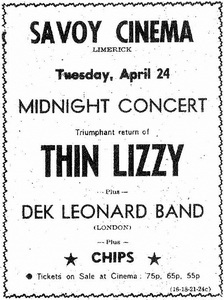 730424 Savoy Cinema Limerick, Ireland "Triumphant return of." 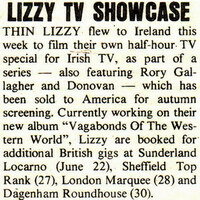 730507 Lizzy return to Britain to continue recording their third album. 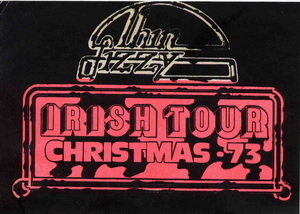 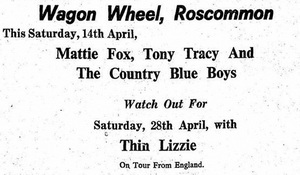 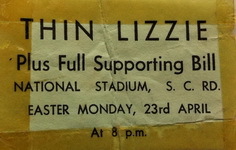 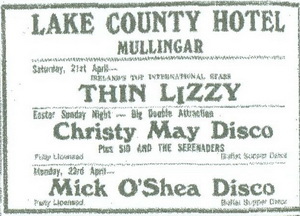 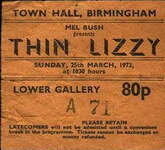 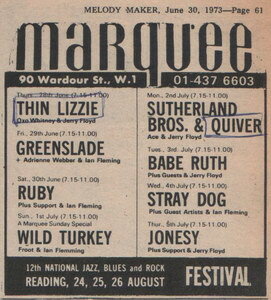 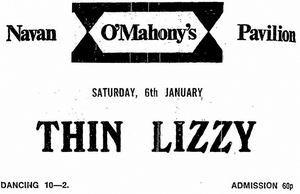 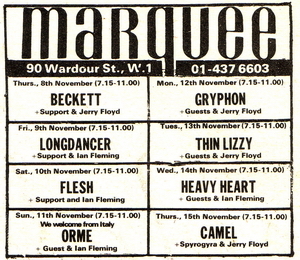 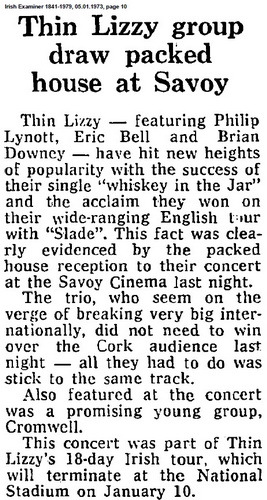 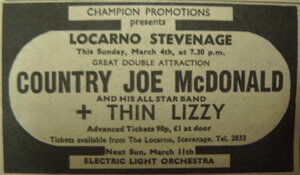 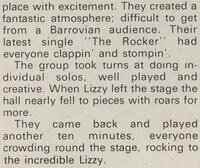 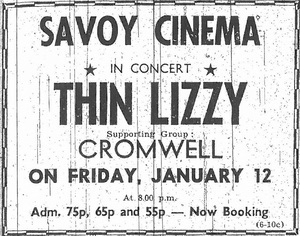 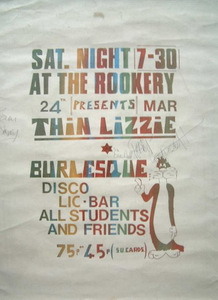 This Thin Lizzy concert was recorded by RTÉ Television and parts of it broadcast on 'The Music Makers', an RTÉ Light Entertainment series which featured well-known performers in both pop and jazz music. 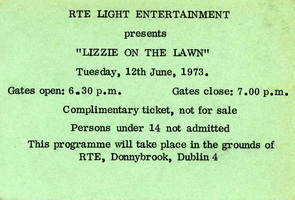 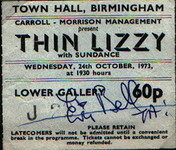 It was televised on 24 February 1974. 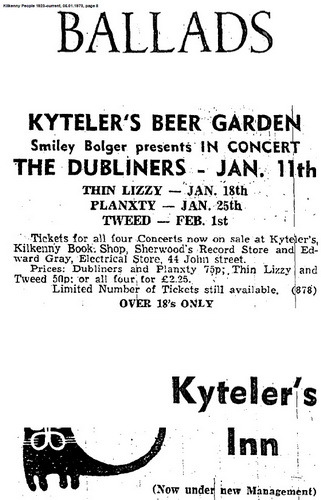 Stills from this shoot were used to illustrate a brief article on the programme published in the RTÉ Guide of 22 February 1974. 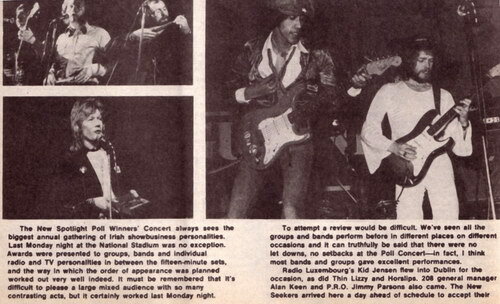 An article about the entire series of 'The Music Makers' was published in the RTÉ Guide of 28 September 1973. 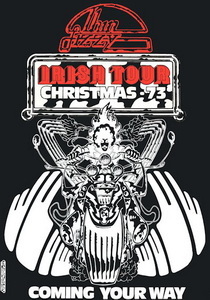 730612 Donal Corvin´s "Gonzo Rock Palace" at Moran´s Hotel Dublin, Ireland The Gonzo Rock Palace served up some really fine sounds last week when Eamonn Gibney and some very distinguished friends including Lizzy stars Philip Lynott and Brian Downey, Terry Woods, Danny Ellis, Gerry O'Donovan, Dave Murphy, Bob Kelly, Fran Byrne and some of the superstar cast all shared the stage. 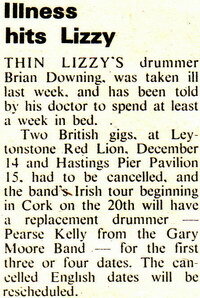 Pearce Kelly plays as additional drummer on some dates due to hand injury to Brian Downey. 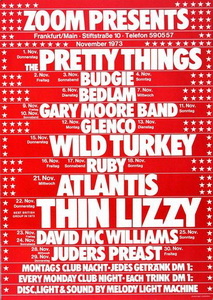 Downey played with his right hand and Pearce Kelly doing all the fills. 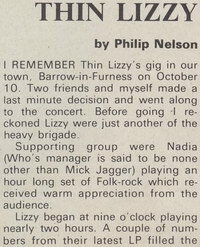 731231 Queen´s University Belfast, Northern Ireland Eric Bell breaks down on stage. 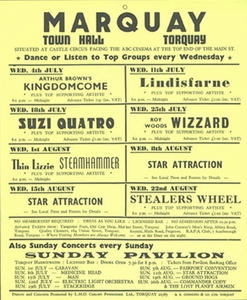 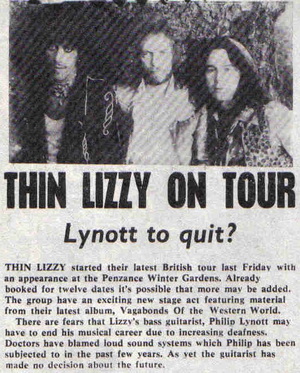 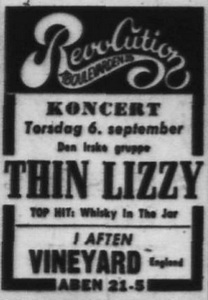 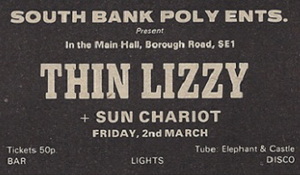 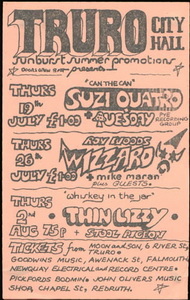 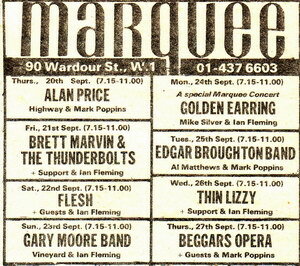 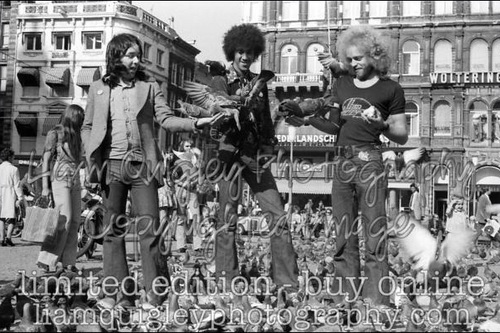 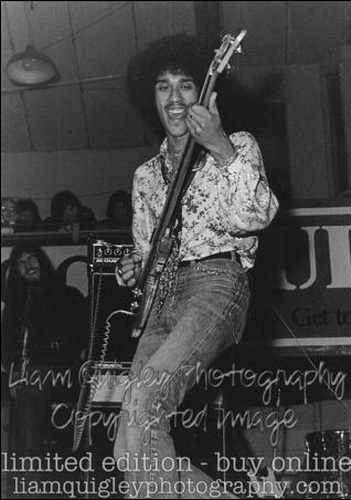 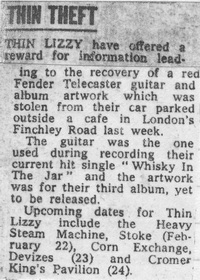 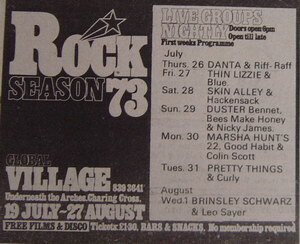 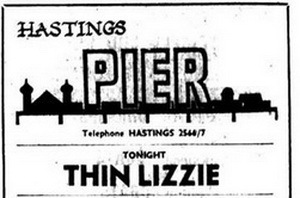 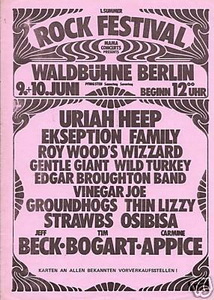 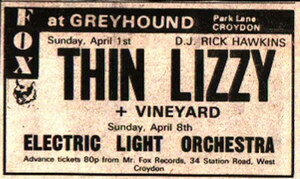 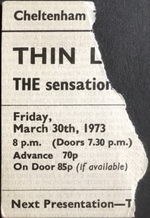 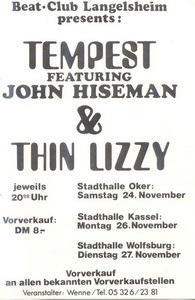 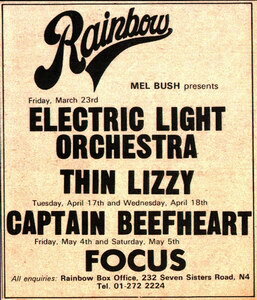 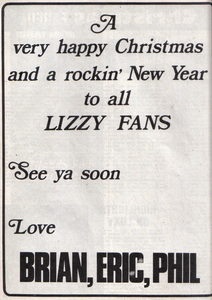 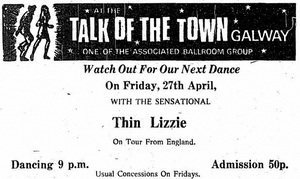 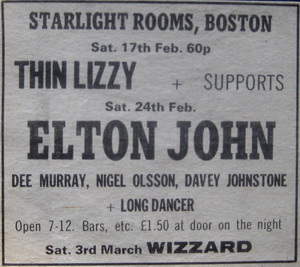 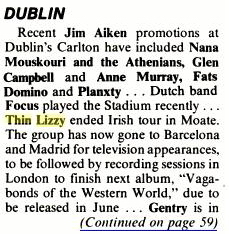 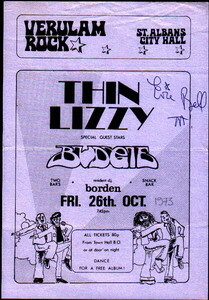 Many years ago probably in early 70s I saw Thin Lizzy at the Viking club at Seahouses Northumberland. 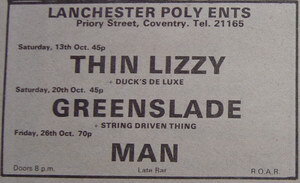 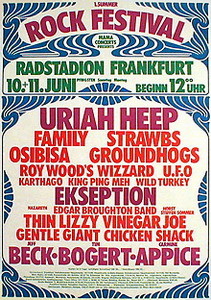 I can't see the gig listed on your site - could you let me know the date? 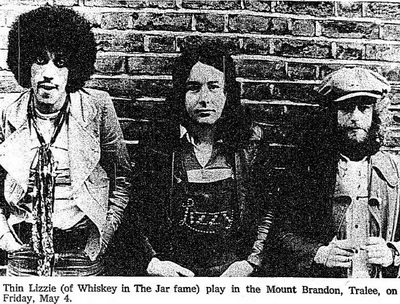 I recall Whiskey in Jar was just becoming a hit and a group of us met the band and they were lovely gents . 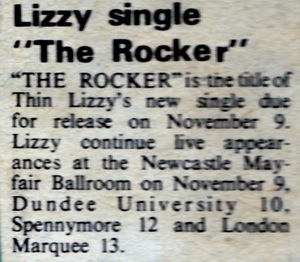 Be great to pin down the date or year.